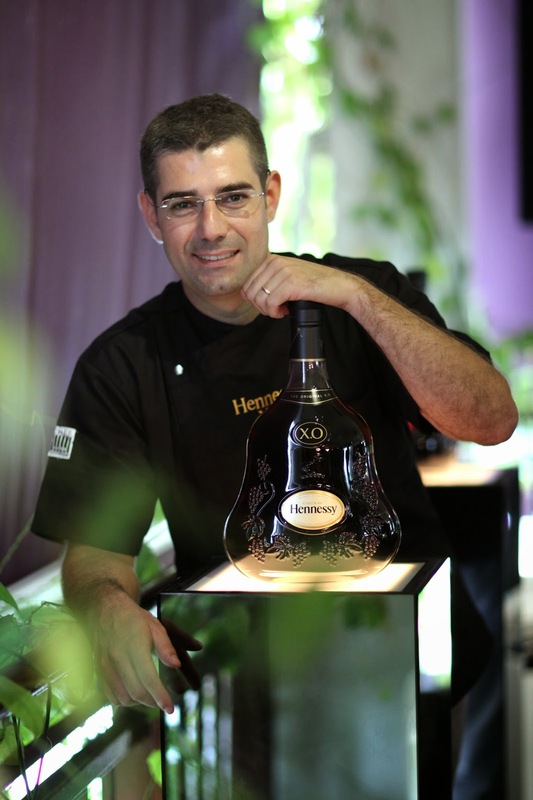 2 days more to the Hennessy Appreciation dinner at Carcosa Seri Negara. Can't help but wonder what Chef James Won and Chef Accursio Craparo will surprise us with the theme "In Good Company". After all, we are looking at 2 chefs who are also good friends. After meeting the 2 chefs personally during the Hennessy X.O Pairing Workshop, I am curious what these 2 chefs will be surprising us with. Bothe Chefs have rather colourful personalities and that is certainly going to be an exciting dinner. Chef Patron of Brasserie Enfin, James Won grew up watching how his Grandmother cooked and developed his love for food. And like his great grandfather who was an Imperial Chef in China, its no surprise that Chef Won ditched his degree in Pharmaceutical Science and pharmaceutical business to pursue his love food including enrolling himself in Le Cordon Bleu. Chef Accursio Craparo is an Italian chef who has a dynamic portfolio with a series of impressive portfolio including working at the “Osteria Enoteca” (A Guida Rossa 1 Star Restaurant) and Joia by Master Chef, Pietro Leemann (1 Stella Michelin). A few more stints and Chef Accursio opened the Restaurant “Gazza Ladra” in the 4 Star Hotel, Palazzo Failla. In less than 3 years Chef Accursio earned his 1st Stella Michelin in 2008. I am super excited. 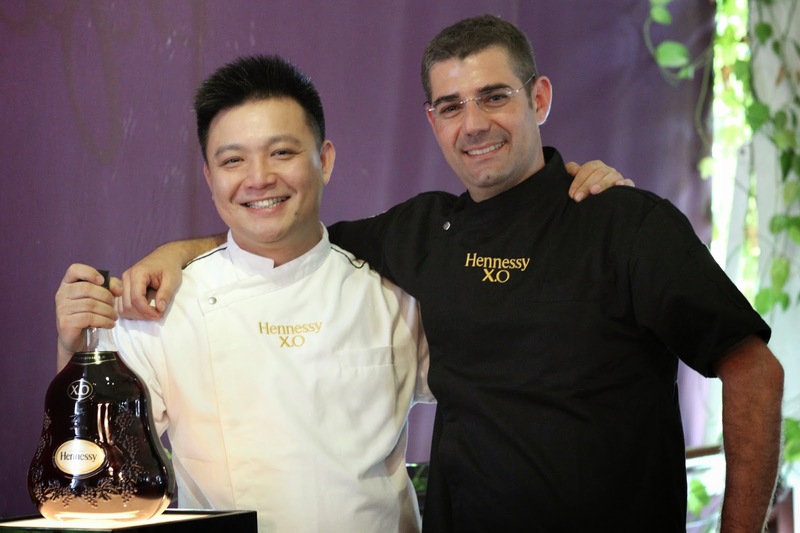 Check out the following video from the Hennessy XO Pairing Workshop and the 2 chefs. 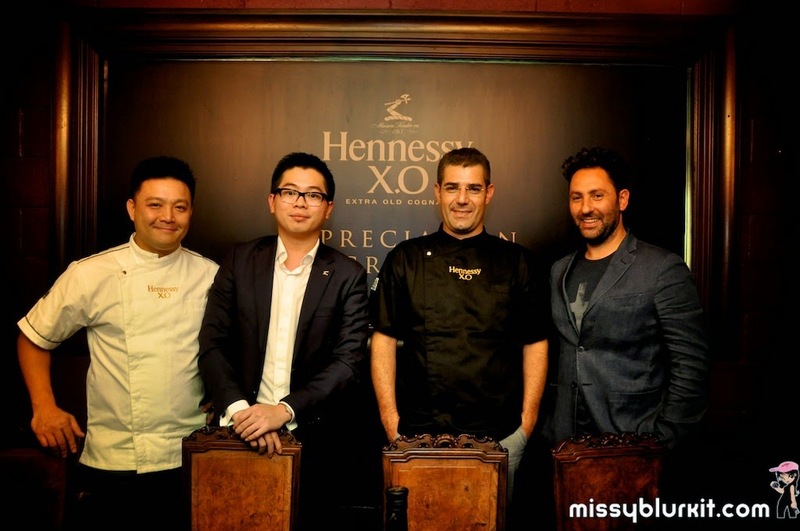 Full set of pictures: Hennessy X.O Pairing Workshop @ Brasserie Enfin. Do head on over to the following channels to stalk me (and show some love too)! 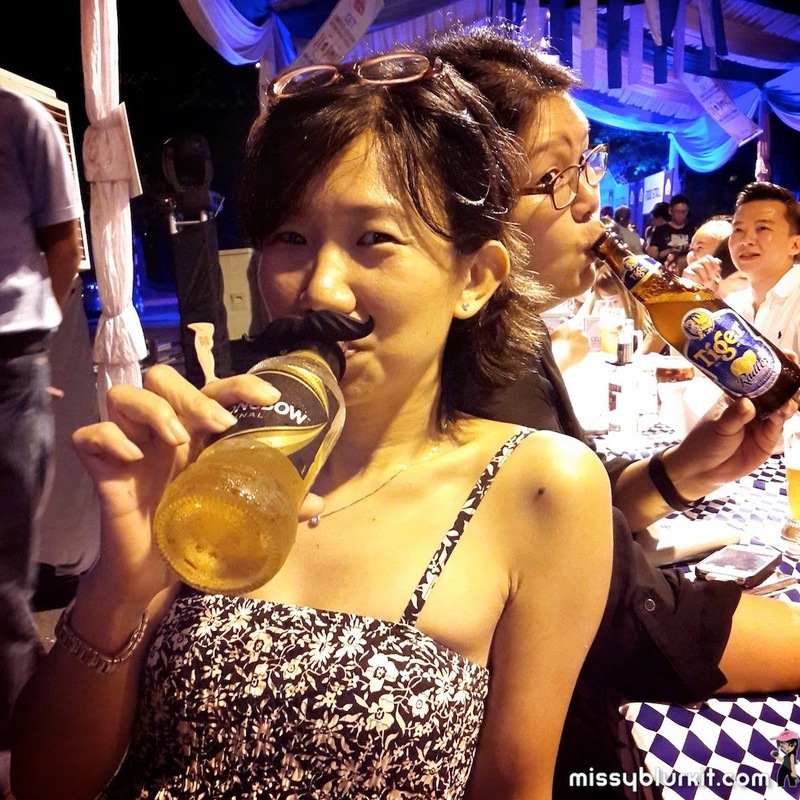 Its Oktoberfest again. Time for merry drinking with the friends and loved ones. Of course one should always drink responsibly and within one's own limits. 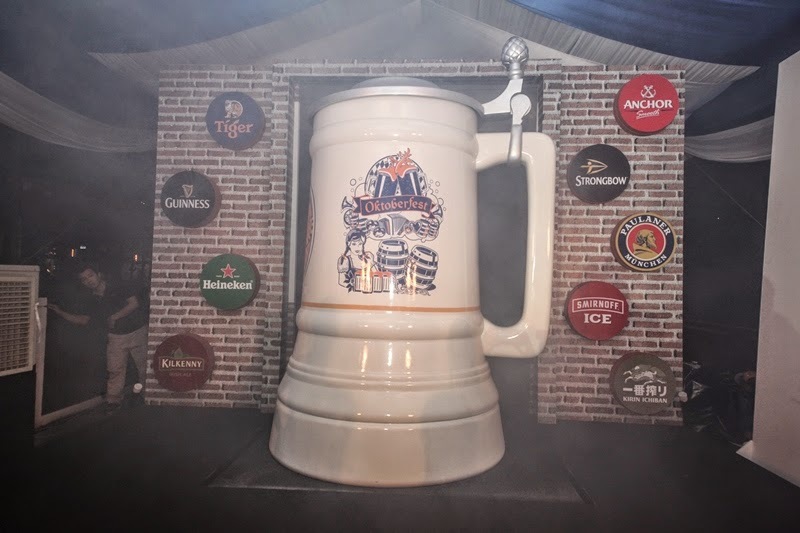 To make things even more fun this year, do participate in the Malaysia’s Biggest Mug “Guess the Litre” challenge. The top 5 participants who provide the correct or closest estimated volume of liquid the receptacle can hold, wins a year’s supply of Tiger Beer! 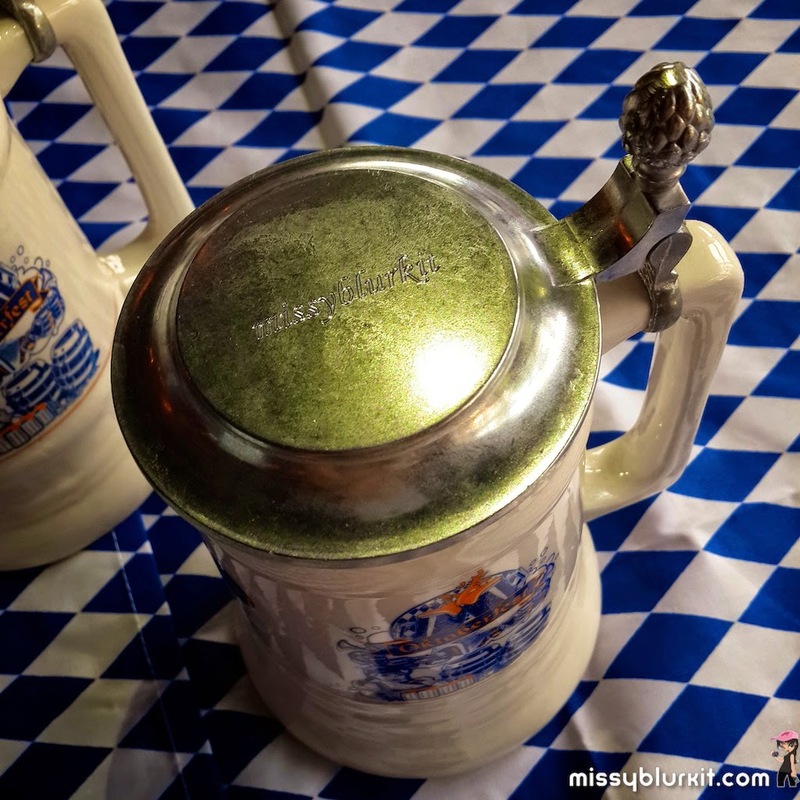 And if you want to own the hand held GAB Oktoberfest mug, all you need to do is to buy four pints or two jugs or two buckets or a tower of either of the participating brands (Tiger, Guinness, Anchor, Heineken, Kilkenny, Kirin, Smirnoff, Strongbow, and Paulaner) for one Oktoberfest mug. Take your pick of 2 designs. THANX for a personalised mug with my name missyblurkit on it. Now no one will accidentally take my mug! 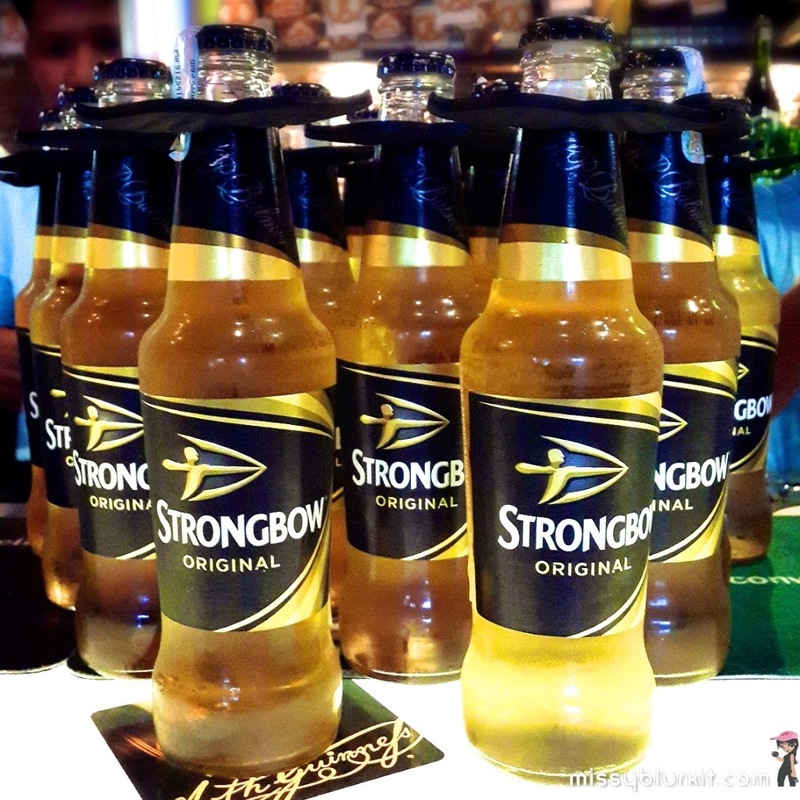 My favourite cider. My fave must have during our pool and BBQ gatherings! 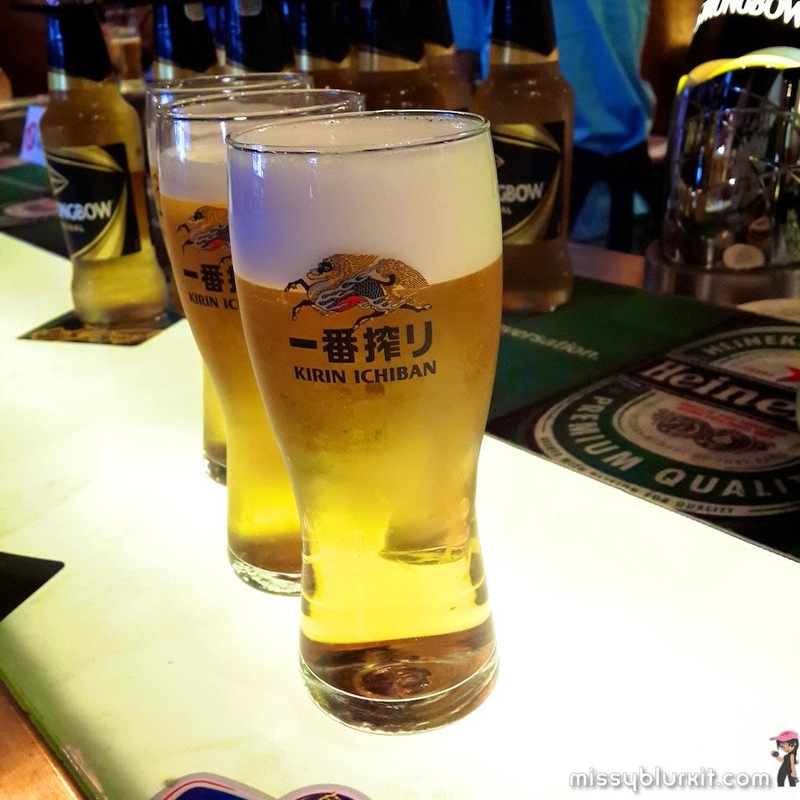 I am glad Kirin Ichiban made it to our shores! Another perfect one for BBQ nights. Lots of laughter with the amazing bunch of Joyce, Suanie, Micheal, Elaine and Jonathan! Moustache does not work on me! 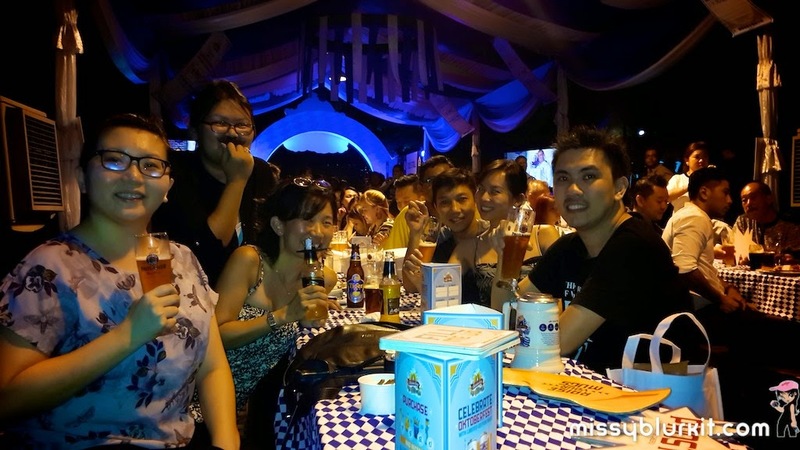 Log on to GAB’s Oktoberfest Facebook page https://www.facebook.com/OktoberfestMY from now until Oct 31 for more news and exciting activities. 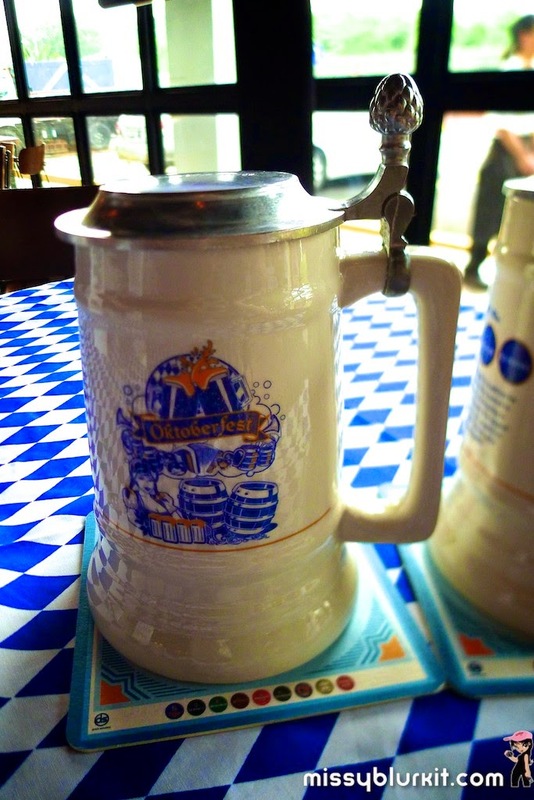 Have fun this Oktoberfest. Do also pop over to the following channels to stalk me (and show some love too)! Serve me bak kut teh and I am a happy girl. While my preference is for the herbal and strong ones, meaty ones are nice for a change. It was a random choice to check out Soon Huat JB Bak Kut Teh in Cheras one fine evening after our appointment. 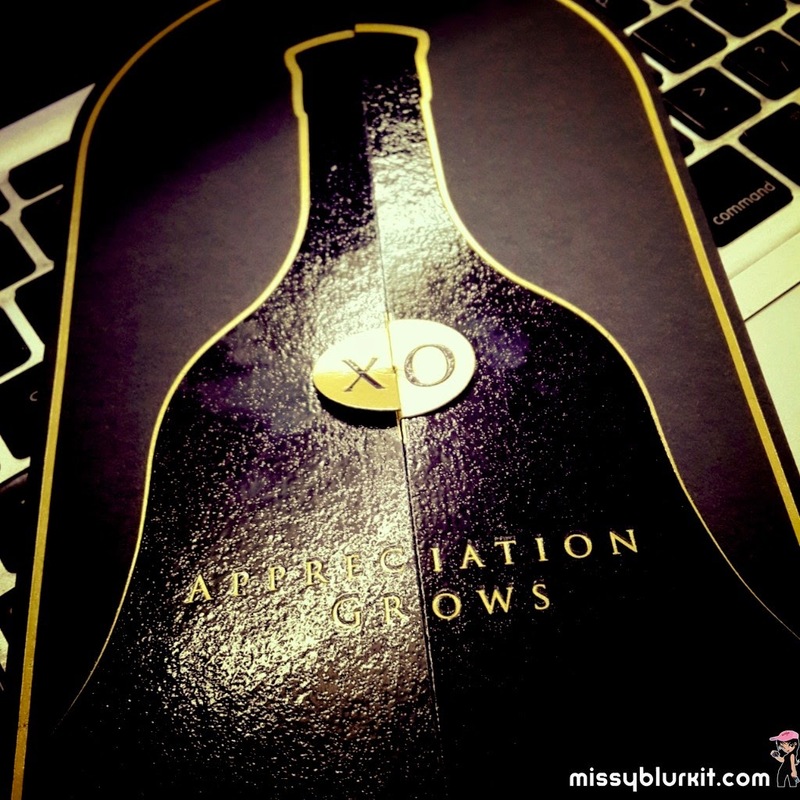 I had a memorable experience during the Hennessy X.O Appreciation Grows dinner in Danga Bay this year. 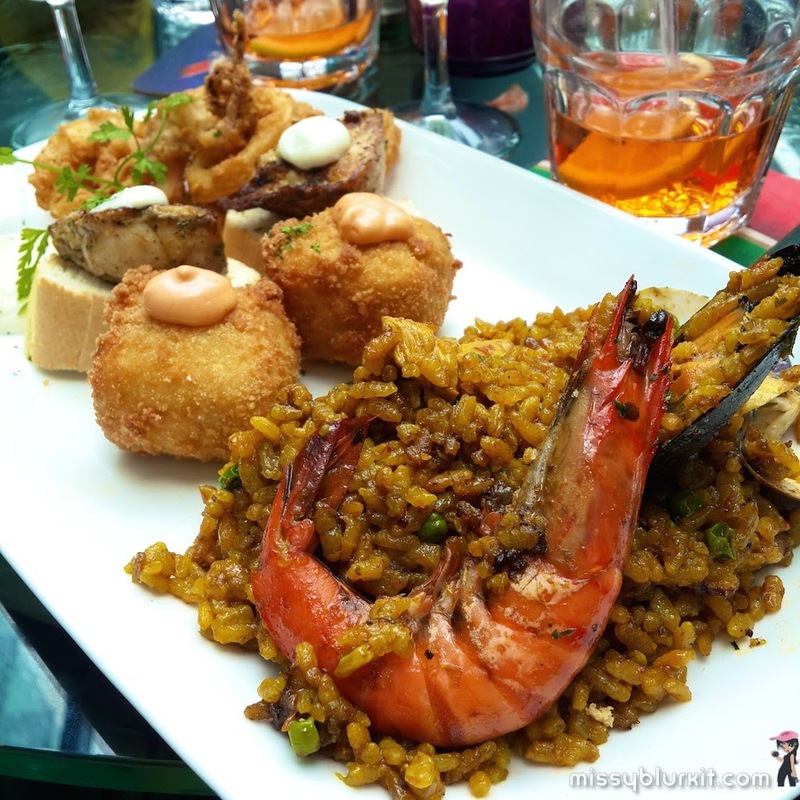 An interactive Hennessy X.O Pairing Workshop was held at Brasserie Enfin, Oasis Ara to build up to the coming Hennessy X.O Appreciation Grows in October. Themed In Good Company, this year’s Appreciation Grows dinner aims to celebrate Maurice Hennessy’s original vision for Hennessy X.O as an exceptional cognac to be shared in the company of family and close friends. 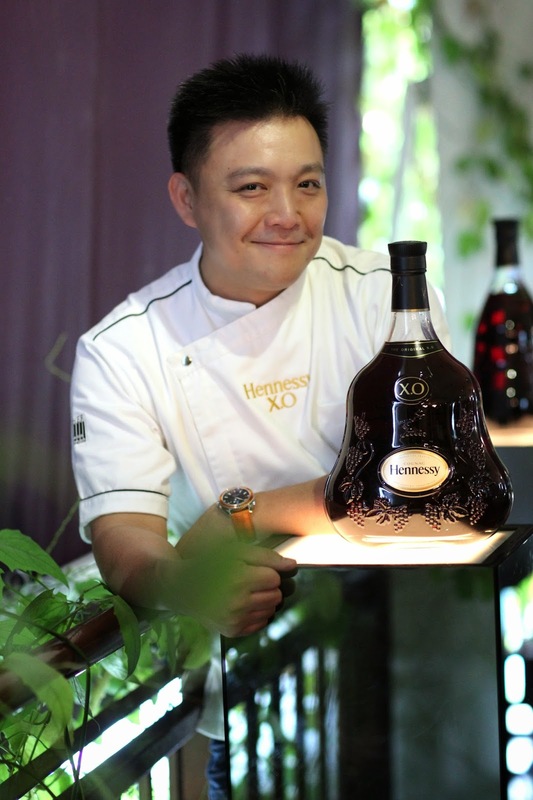 And for the first time ever, Hennessy X.O have paired two chefs for the coming dinner. 1-Stella Michelin Chef Accursio Craparo and Chef James Won are both good friends to start with and it will certainly be interesting to see what the talents have up their sleeve in October. The Hennessy X.O Pairing Workshop is a prelude to the dinner. 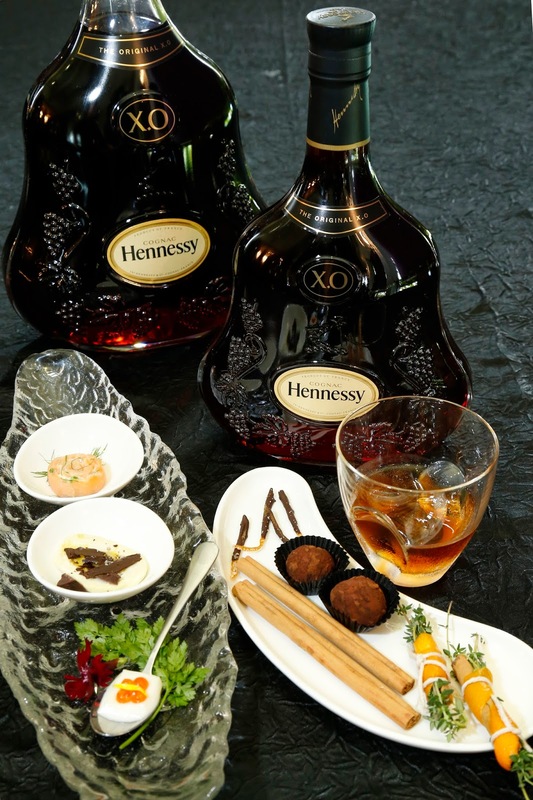 We are taken on a lovely journey of Hennessy X.O and food starting with technical tasting session of Hennessy X.O. by Brand Ambassador of Moët Hennessy Brands, Chong Wai Keng. Rich and elegant with in dried fruits and sweet spices like cinnamon. Velvety and lasting notes of sweet vanilla. I like mine neat and slightly warmed with the heat of my hand while the hubster likes his on the rocks. What about you? The modular tasting workshop by both Chef Accursio and Chef Won was more than just interesting. Both chefs led us through different ingredient from simple and humble cinnamon, delicate tofu and even chocolates. Chef Accursio’s theme of “Contrast Contemporary” featured Asian tofu, Salmon with cream fraiche and Malaysian chocolate with pepper and salt. Chef Won’s theme of “Classical Complementary” featured Vietnamese cinnamon,chocolate truffles and pretty bouquets of Mandarin peel with rosemary. A sniff or a bite where applicable of the ingredients proved to be a delicious exercise. 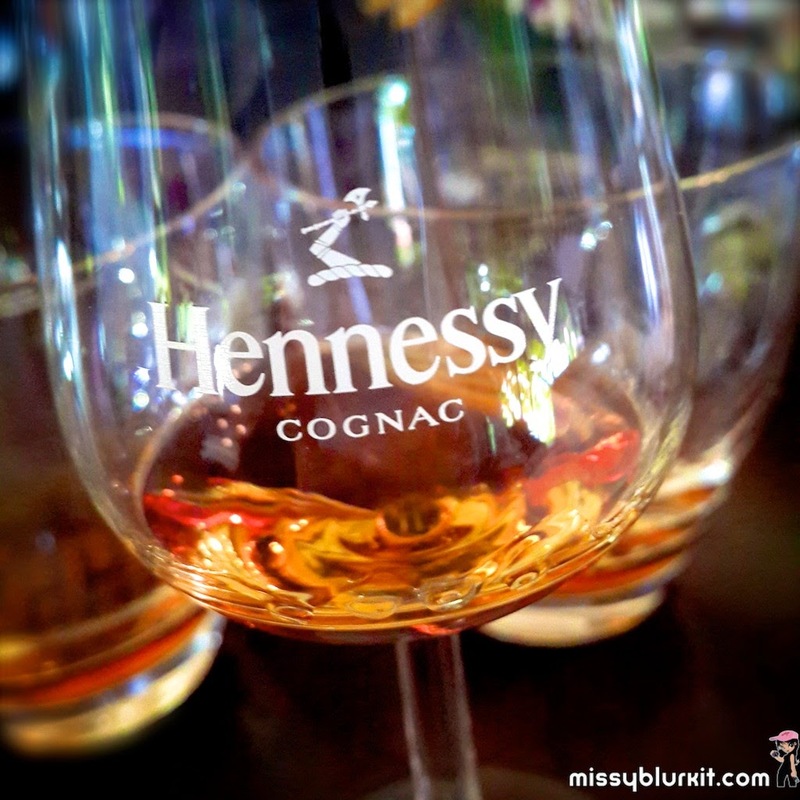 With a sip of Hennessy, we learn how each flavour and taste is enhanced.Its amazing how Hennessy X.O. unveils the different notes and depths of the ingredients. “The right pairing with the cognac can accentuate the good flavours of a meal, bringing out certain nuances and flavours. If it is a complementary match, regardless of it coming from conventional or unconventional ingredients, the characteristics of both the cognac and the food will be enhanced,” said Chef Accursio Craparo. 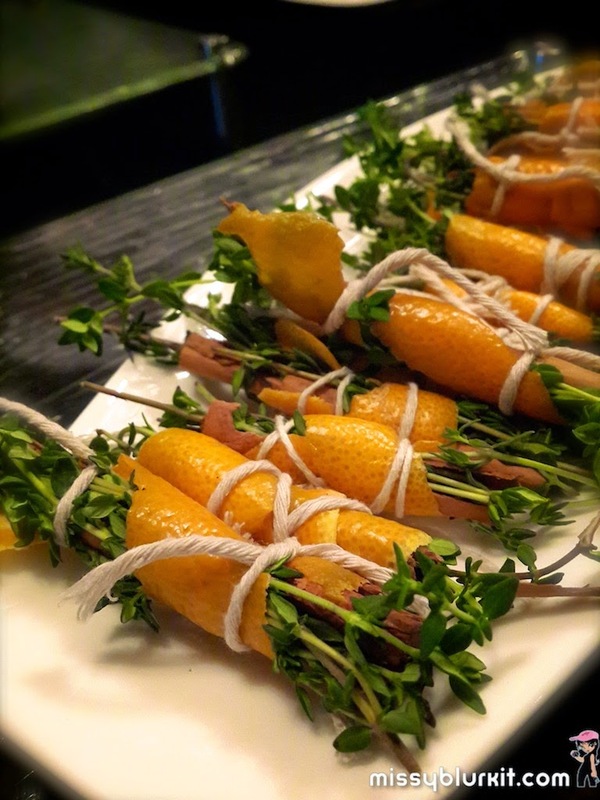 These pretty bundles of Mandarin peel with rosemary and cinnamon proved to be so popular that many of us took a few home. It was refreshing on it own. A sip of Cognac and the flavours develop to a sweeter note. And if one takes a bite of the peel, its almost umami! Smitten with a sniff. Enhanced with a sip of Hennessy X.O. Its been an eye opener...palate teasing and I am definitely looking forward to the coming Hennessy X.O Appreciation Grows dinner at Carcosa Seri Negara next month. 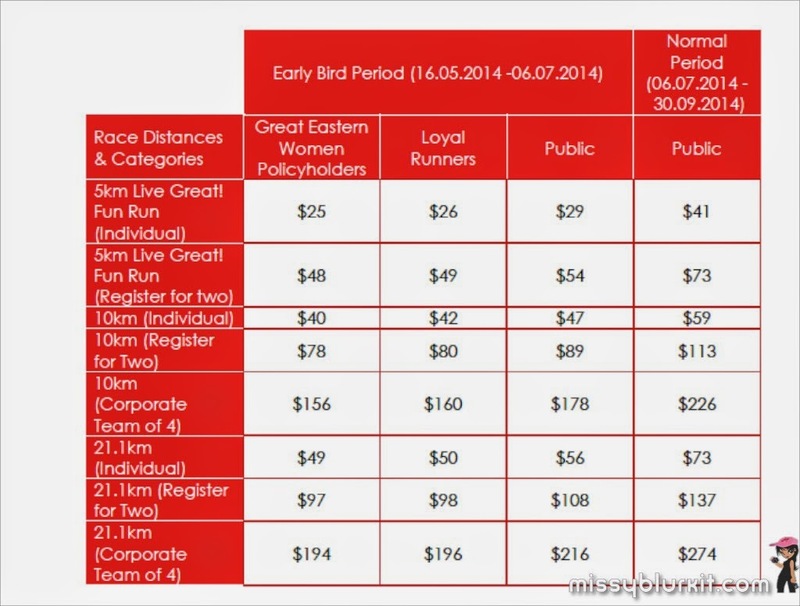 If you haven't signed up for the coming Great Eastern Women's Run 2014 then hurry up and register. I now the run is in Singapore but Malaysians can always take advantage of a trip there for some Christmas shopping or have a run while holidaying with the family! Registration closes 30th September 2014. Unfortunately there's only 5km and 10km slots left but I assure you that the view of the route is worth running! Flagging off at TheFloat@Marina Bay, the race route is going to be a fun and scenic one! Register now: http://www.greateasternwomensrun.com. I love my Sundays. 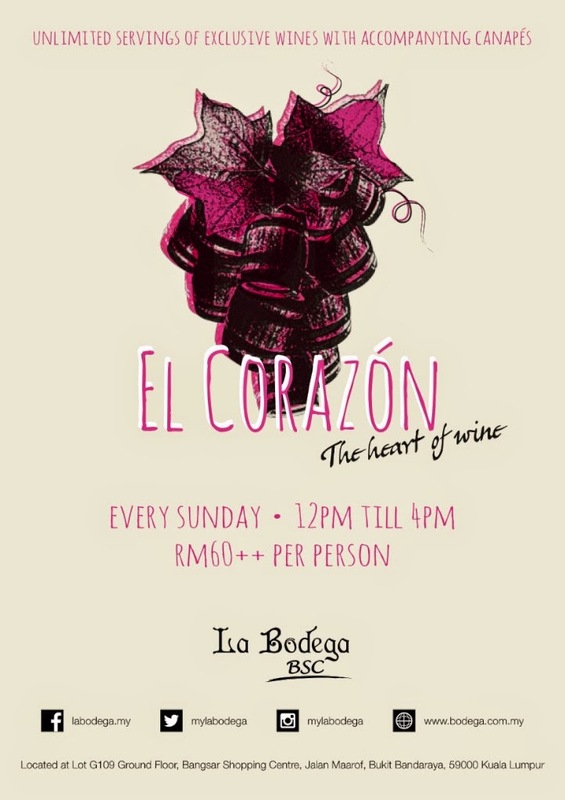 Last Sunday was another perfect Sunday with a nice morning run and a bubbly brunch El Corazón with a bunch of fun friends at La Bodega, Bangsar Shopping Centre. 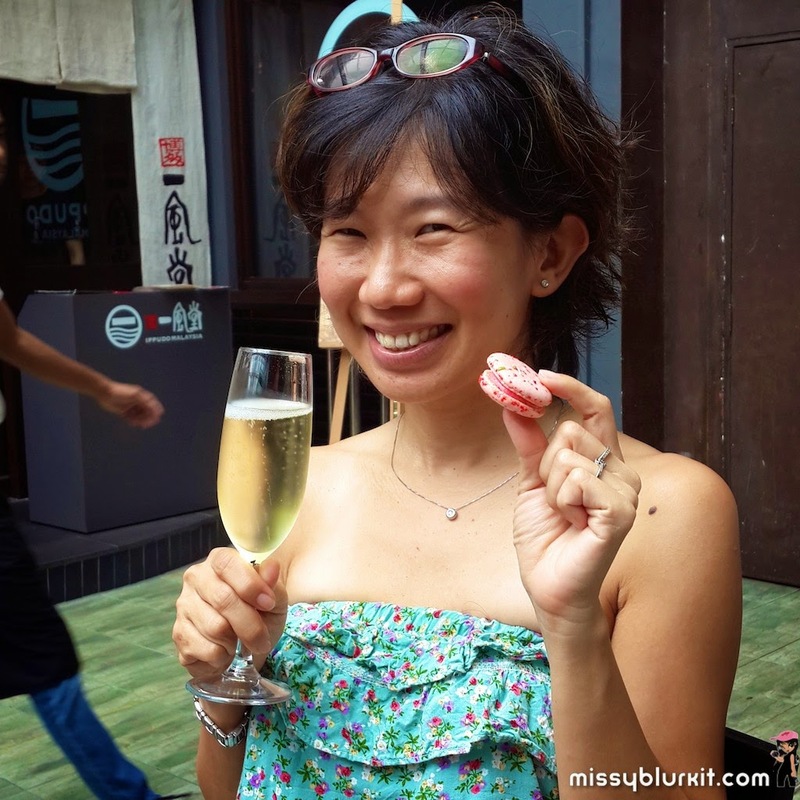 Its free flow of bubblies including canapes from 12pm to 4pm for RM60++. Definitely the most affordable free flow brunch in town with a different wine theme each month! For this month, the El Corazón features Tio Pepe Fino Muy Seco sherry that is carefully paired with an assortment of savoury and sweet canapes. 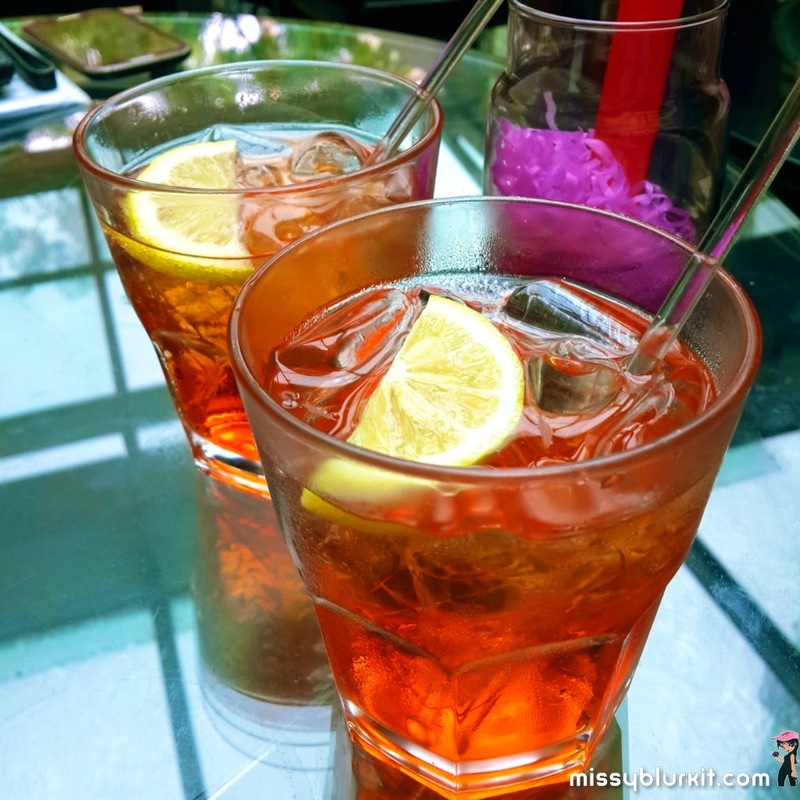 While we settled down, our welcome drink was a refreshing Italian aperitif Aperol Soda. 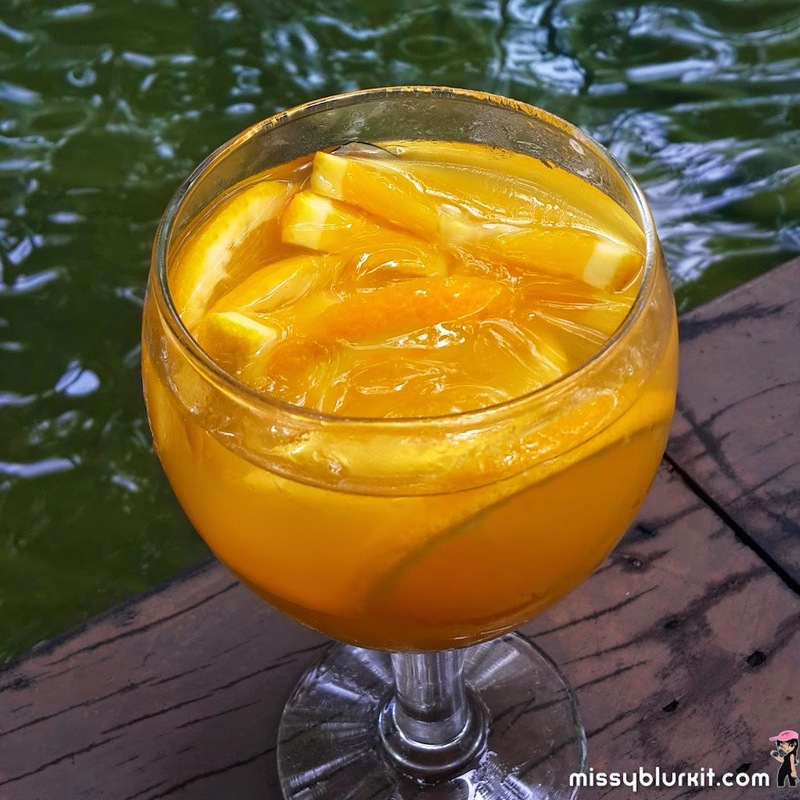 A vibrant orange infusion with hints of vanilla making it a very delightful drink to kick start our Sunday brunch. The canapes arrive in 2 different platters. 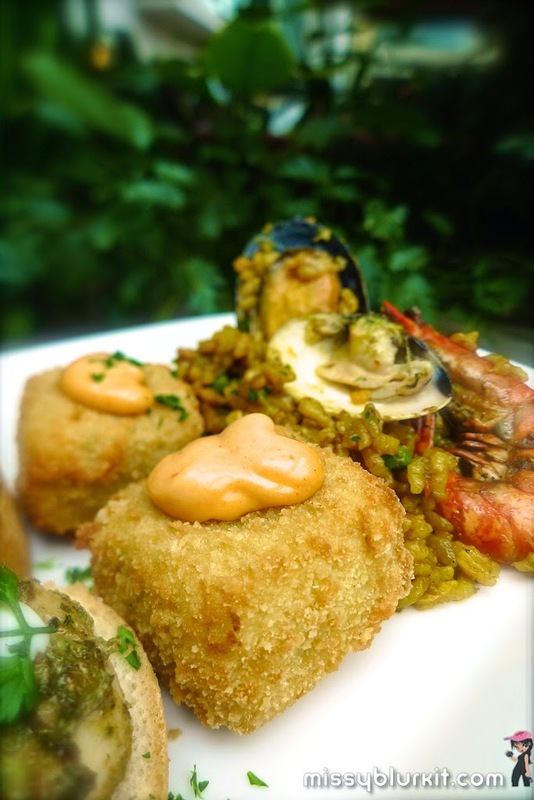 The savoury was a platter of Paella Valenciana Mixta, Croquetas Bacalao, Calamares Fritos and Pinchos Morunos. Fancy names and equally fancy in your mouth! Each of the canapes are planned to compliment the cocktails for the day or is it the other way round? Either way, its delightful pairing that we are talking about! Its a pretty platter and the best bet is to start from the calamari that had the hubster going gaga. I reckon in life its all about sharing and to a large extent some giving and taking because the hubster pretty much ate up my share of the calamaris when I turned around for a few seconds! In my case I started off with the Paella as I was quite famished after a long run. 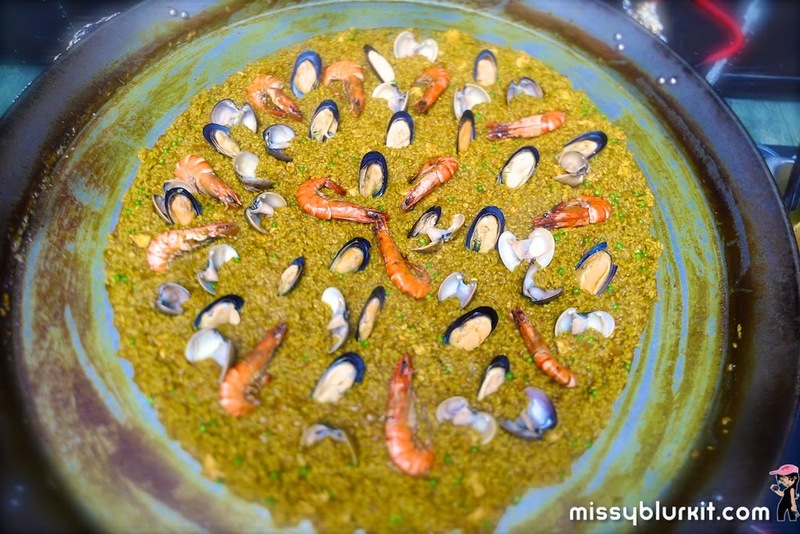 Spanish rice cooked in a comforting chicken broth with tiger prawns, chicken, mussels and clams. The unmistaken colour and flavours of saffron made this the most memorable dish on the platter for me. These Cod fish croquettes are really delicious and a comforting memory of my childhood favourite fish fingers. Lightly battered with a crispy crust and when you bite in, you get the most delectable soft cod fish mix. Eaten with the chili mayonnaise for a different dimension. 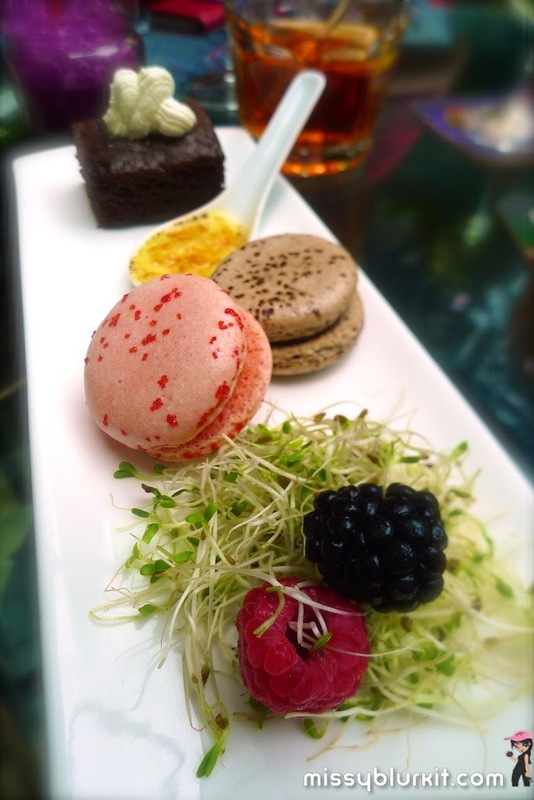 The desserts come looking pretty. 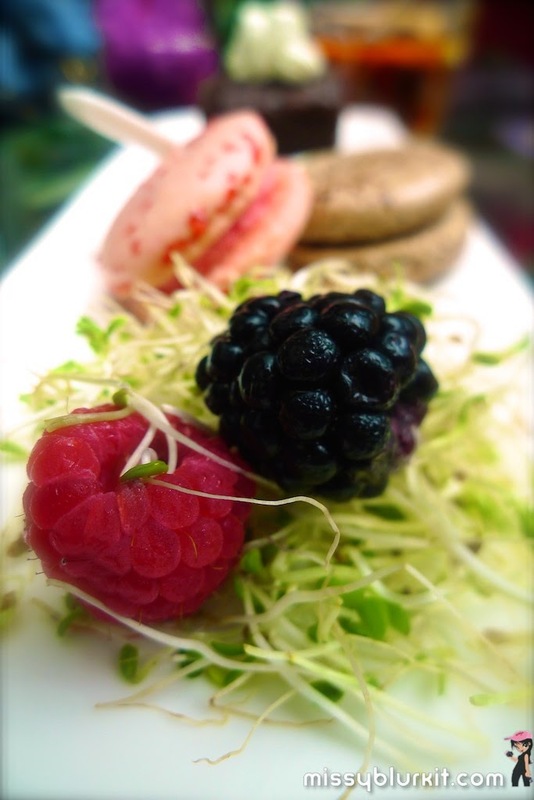 The berries kept me really happy and no one should complain with choices of macarons, chocolate brownie and creme brulee for a Sunday afternoon. 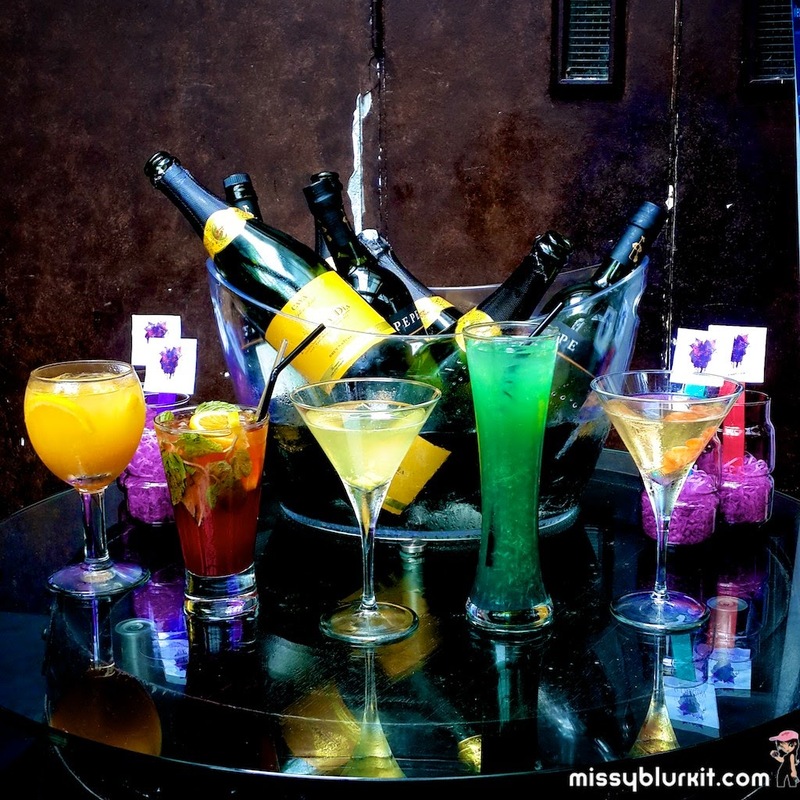 Its almost like a rainbow of pretty drinks when we look at La Bodega's El Corazón brunch. The food proved to be vibrant and the drinks were equally delightful too. 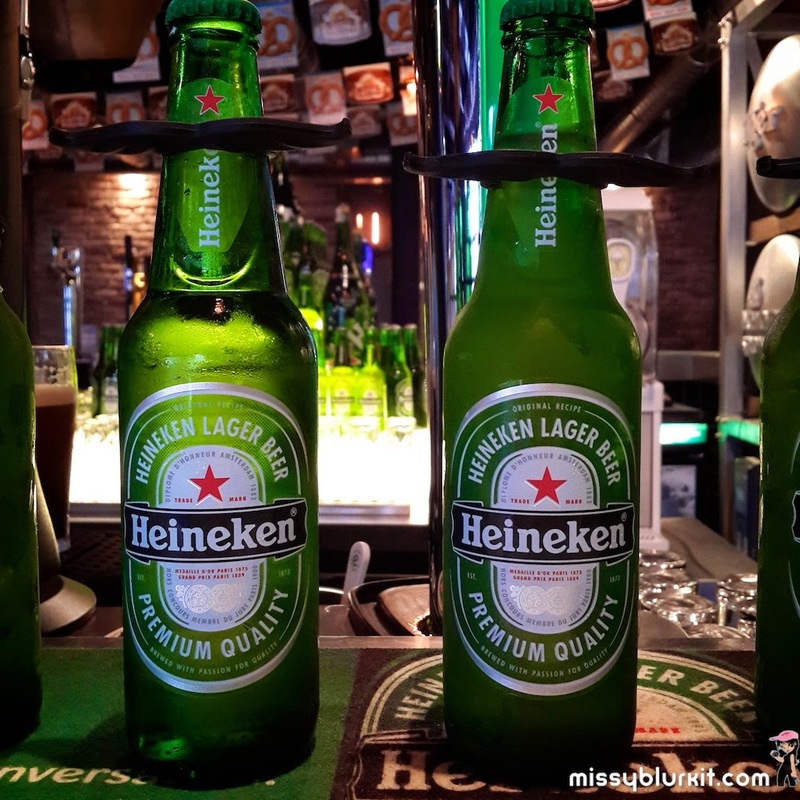 If you can't decide which one toopt for then opt for all...its after all free flow from 12 pm to 4pm. 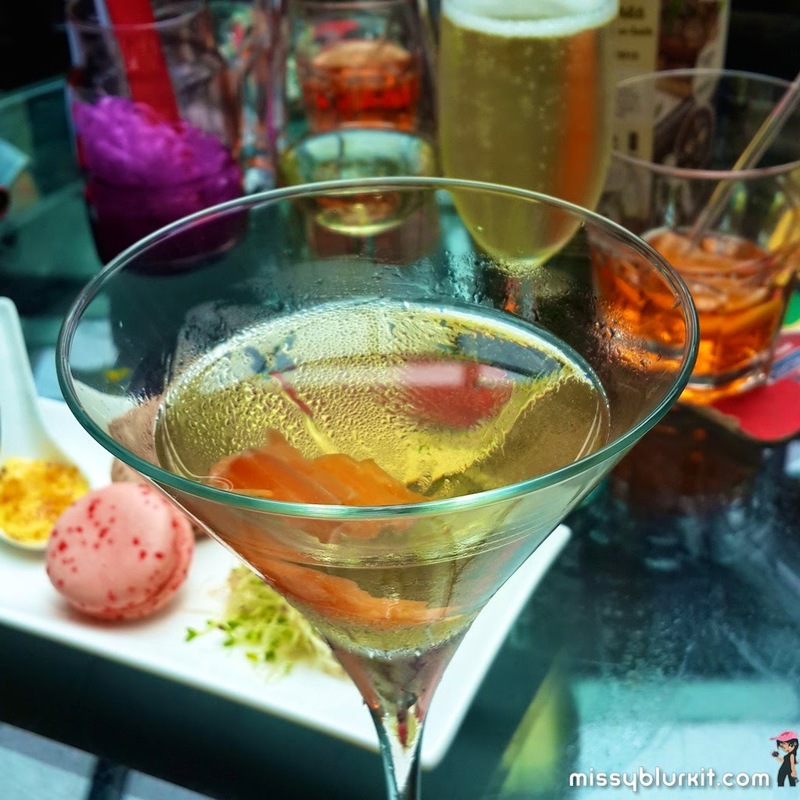 And when you have decided which your fave cocktail is...well you can always have more of it! Citrus Cup: Orange juice made perfect with lots of oranges, a dash of drambuie and Tio Pepe. Garden Sprite: A refreshing mix of Tio Pepe, lychee liqueur, strawberries, oranges and mint leaves. Toffee Apple: Martini built on Tio Pepe, Broker’s Gin, white creme de cacao, freshly muddled apples and brown sugar. Oceanic: Tropical ocean cocktail of blue curacao, orange juice and Tio Pepe. Salmon Roll: Martini of Tio Pepe and Martinin Blanco shaken and double strained into a martini glass and garnished with smoked salmon roll on a stick. And after going through 5 cocktails, my favourites are the Citrus Orange that proves to be a refreshing choice after a heavy meal and of course deceivingly does look like a glass of orange juice to get mummy's approval! Uniquely different from many other drinks would be the Salmon Roll that reminded me of a Martini with olives except this time it had a slice of salmon in it for that savoury touch. Look mum! Its orange juice! And because its Sunday, a glass or more of Cava is always a welcome. And when you have good friends with our, Cava goes a long way and does wonders even if the weather is wet and gloomy. You got to love the folks at La Bodega because each week, there is a special addition thrown in to the El Corazón brunch. And during my visit it was the Noche Y Dia Cava that was the special addition! 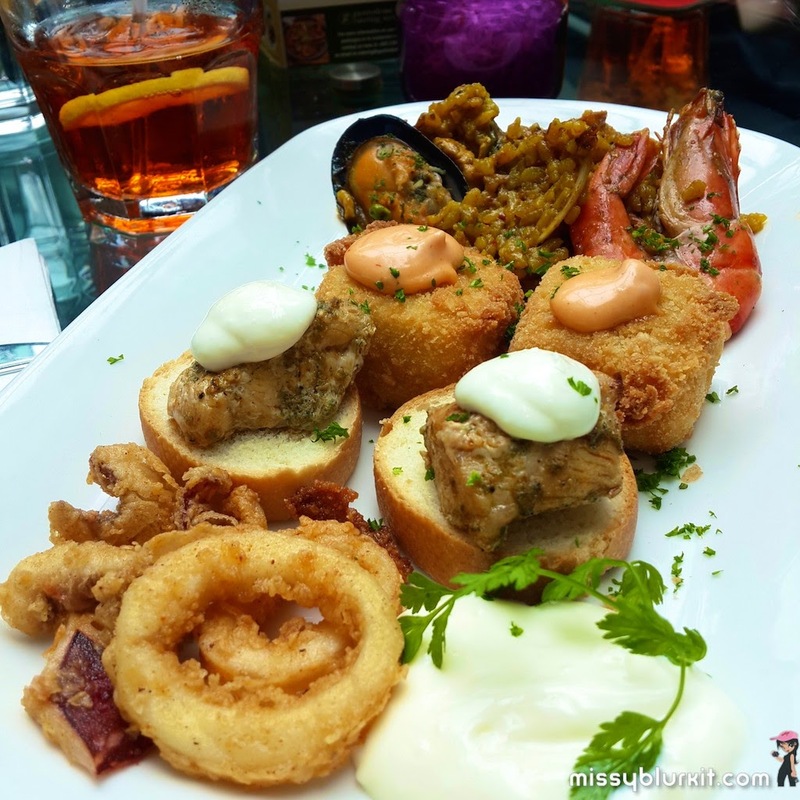 So last Sunday, its RM60++ for all a plate of savoury canapes, sweet canapes, one Aperol, free flow of the featured wine and Cava too! 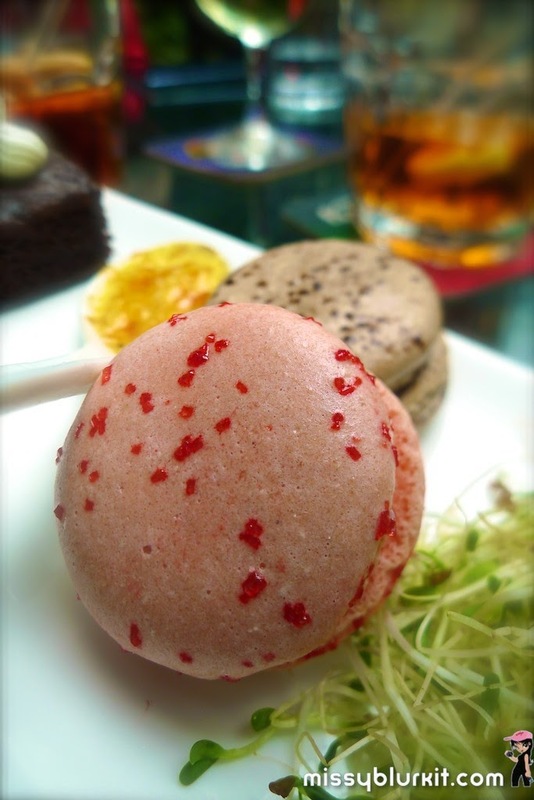 A good morning run, a feast for the tummy and some bubblies with macaron...you can't take my smile from me! 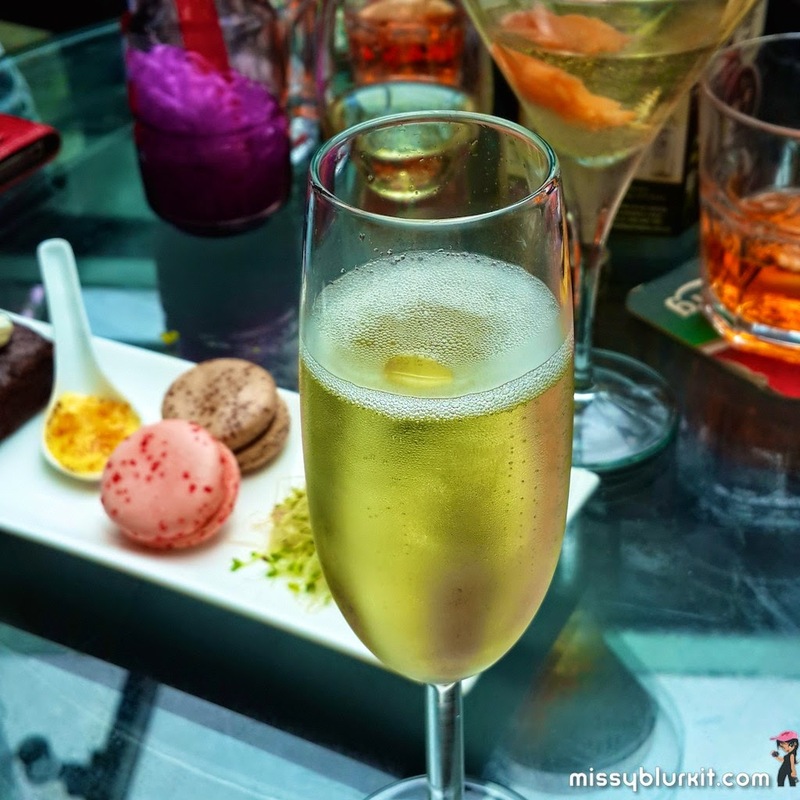 So head on to La Bodega in BSC for what I would consider to be the most affordable Sunday free flow brunch in town complete with canapes and lots of bubblies. Do enquire with the waiter on the featured wines since La Bodega like keeping things fresh for its diners by featuring new wines and food from time to time. Full set of pics in the Facebook album El Corazón. Do also head on over to the following channels to stalk me for more daily updates! 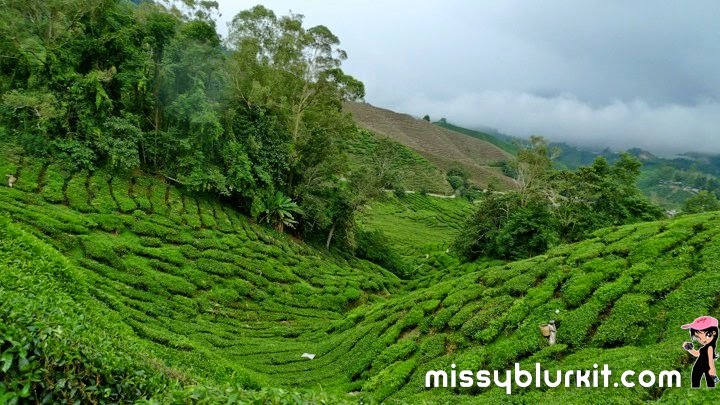 9 more days to the the funnest run ever in Cameron Highlands. Here's some things that you can do to prepare for it! (1) Collect your run pack! 2 dates and venues. Please remember to bring along your IC and your run confirmation slip. If you are collecting the run pack(s) on behalf of others, you would need to present a photocopy IC of the participant(s) for identification purposes. For those with minors, please bring along the signed consent form, which is part of the confirmation slip. Here's some of the goodies you will be getting other than your run tee (in another bag) and remember to stay back for the delicious tea session after the run! (3) Transport sorted out? If you are driving up, please make sure that your car is ready for the drive. Get it serviced and tyres changed if necessary! (4) Its a Mad Hatter Tea Party’. So its time to get your hats ready. You can always make use of this weekend to buy yourself one...or make one yourself. And for those last minute folks...there will be a stall selling hats that may suit your tastes. 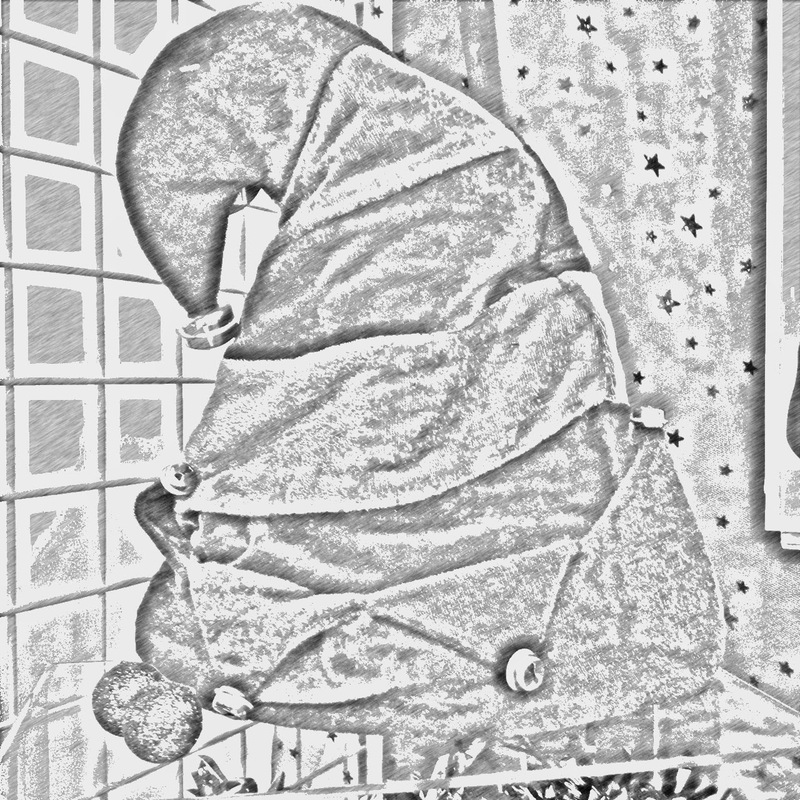 wacky hat! Hmmm...can anyone guess the colours of my hat? Parking is extremely limited at the Sungei Palas Plantation on the event day. Do take advantage of the complimentary shuttle services that are departing from the official partner hotels up in Cameron Highlands. To ensure that there are sufficient shuttles for everyone, the organisers will be taking a short census during the 1st Run Pack Collection Day at Fitness First, to see how many participants require the use of the shuttle service. If for any reason, you will not be able to be at the 1st Run Pack Collection Day, do contact the event organiser to let them know that you will will be utilising the shuttle services, and from which hotel you will be taking the shuttle from. 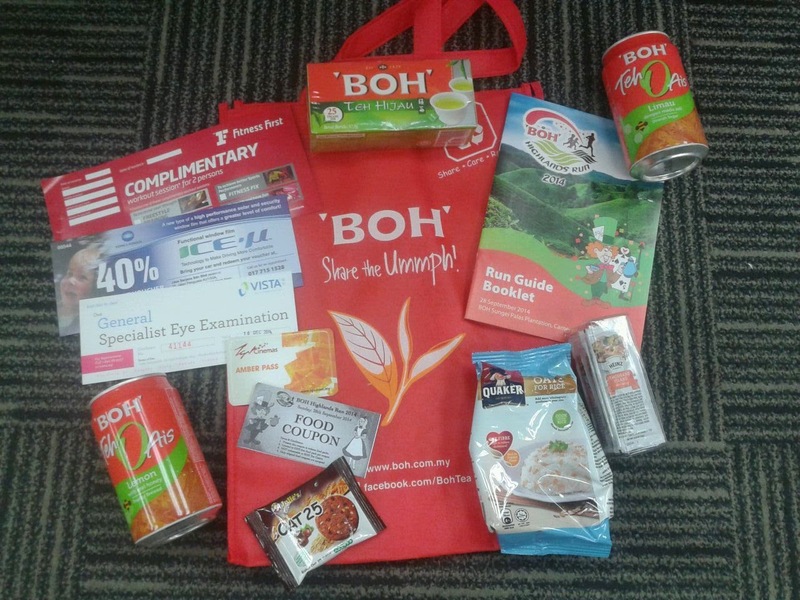 More pics in the Facebook album BOH Highlands Run. Do also head on over to the following channels to stalk me for more daily updates! Help! We need to feed the vampire. The title sounds wrong but we seriously need to feed the Vampire which is turning hungry (my code name for the blood bank is Vampire). Block your calendars for Saturday 27th September 2014 and walk into any of the following list of MBO Cinemas nationwide to donate blood. Rest assured that you will be in the good hands of St John's Ambulance Malaysia folks and not some crazy Vampires. 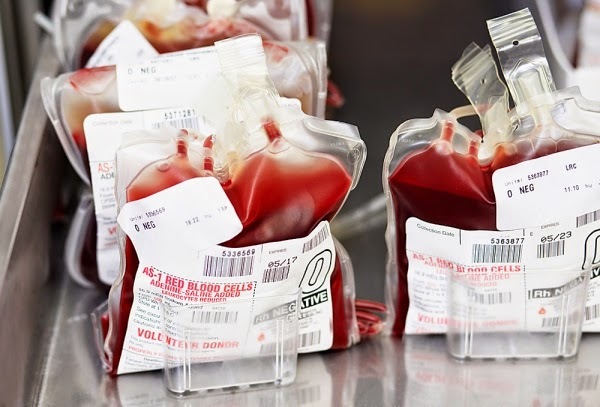 • Male donors can donate blood every 12 weeks and female donors can give blood every 16 weeks. • Sleep early the night before, eat and drink well too but stay away from alcohol the day before. There is nothing to fear during blood donation. And its also for a good cause. 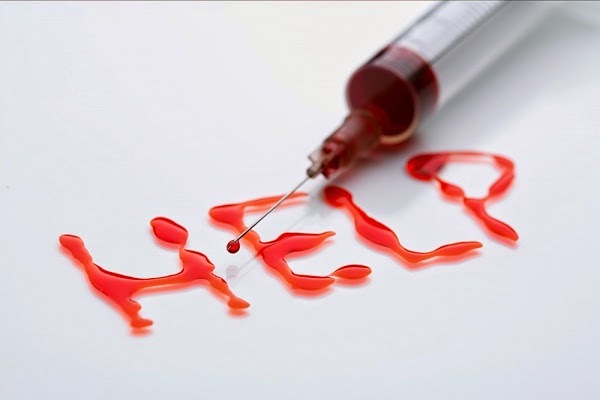 You never know when is it that you or loved one might just need blood help from the Blood Bank. So keep the Blood Bank well stocked at all times. 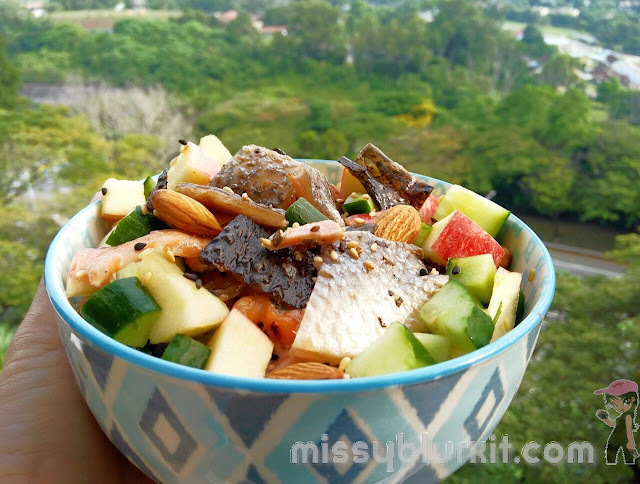 I love clean eating and Japanese is definitely one of the best eat clean options possible. 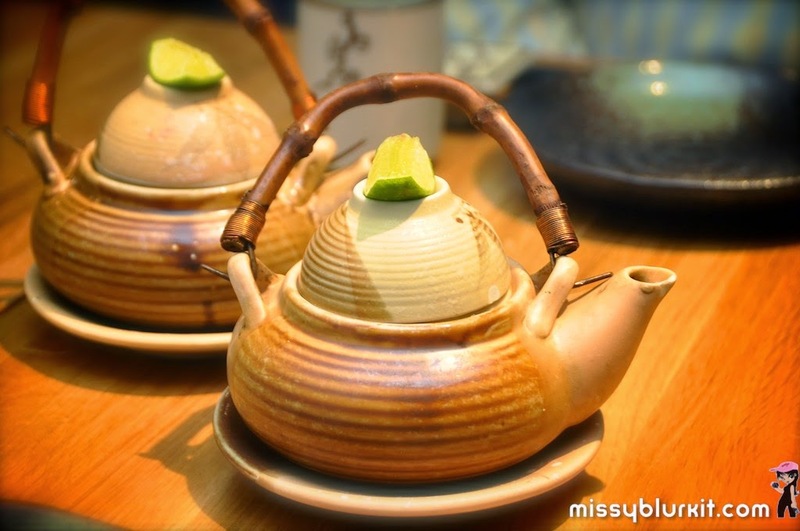 Eyuzu Japanese Cuisine is one of our favourites especially when we are in PJ. 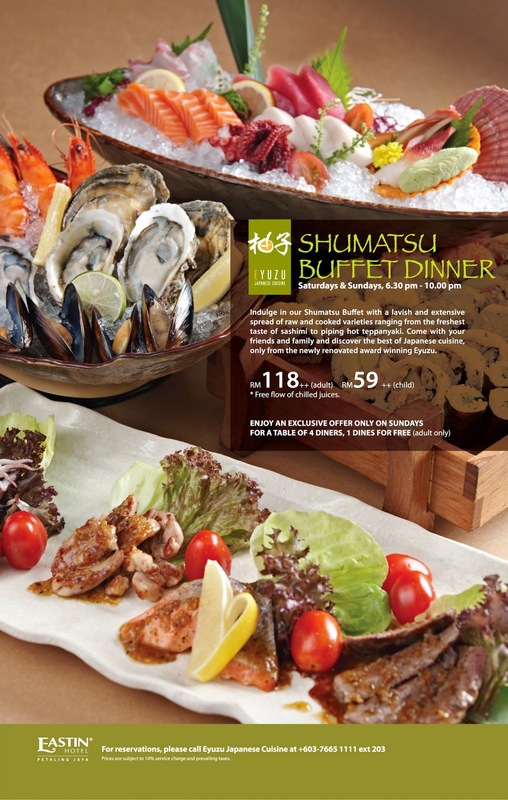 This newly renovated restaurant is a must visit for the weekends for its value for money buffets. 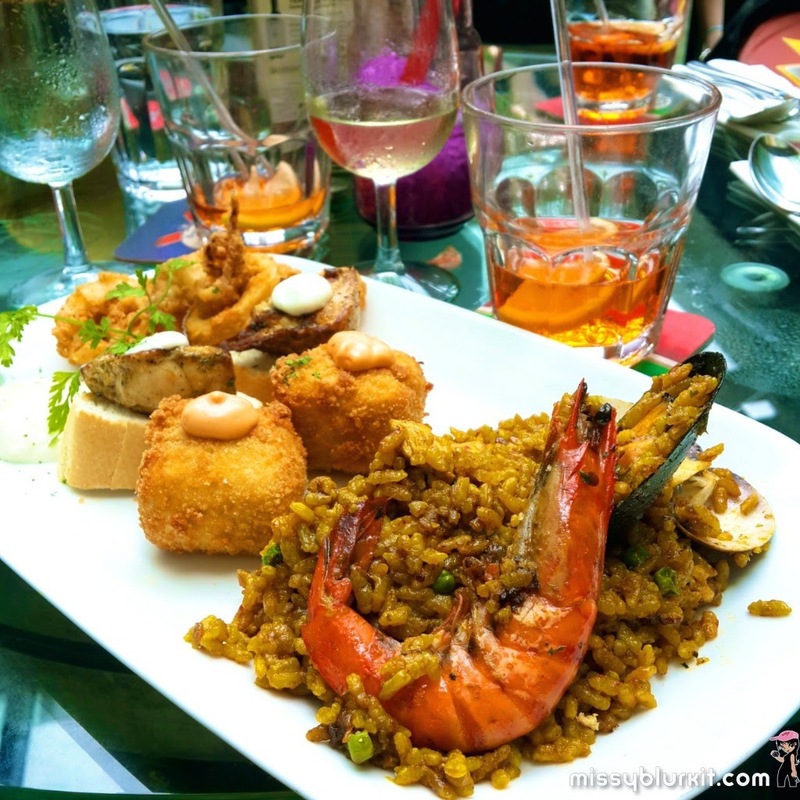 And weekdays, the ala carte menus are just as good..and its made better with the discounts from Offpeak.my that offfers a lovely 30% for ala carte items between 12pm to 2pm. And if one notes the timing for the discounts, its actually lunch hour! Brilliant spot for lunch meetings in PJ! 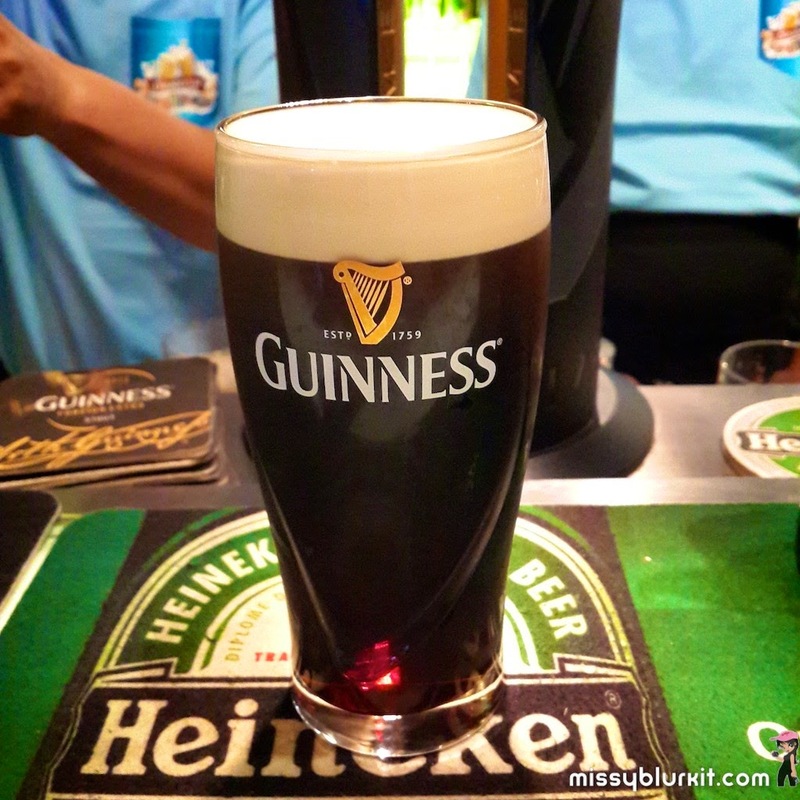 So off we went, keeping my diet clean and indulging in carbs too since our visit was smack before I flew off to Da Nang for my run. This is a must for soup lovers and happens to be one of Eyuzu's signature dish. 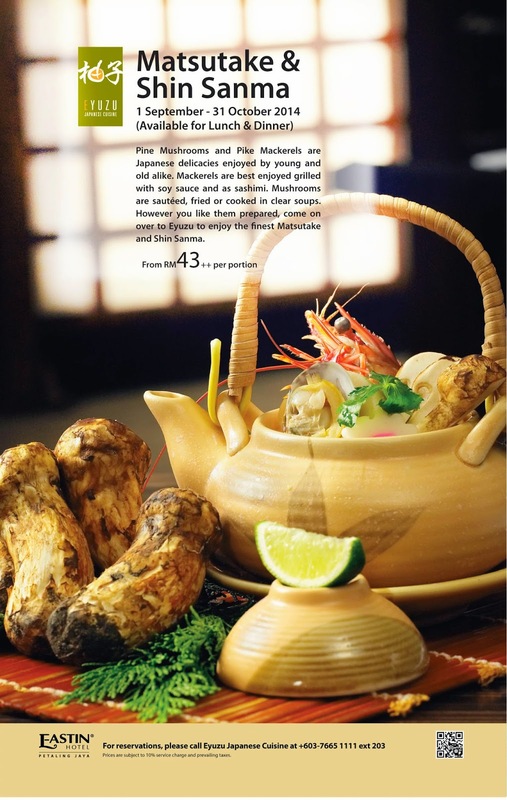 A comforting broth cooked with assorted seafood, chicken and mushroom. Optional with lime but I personally prefer it with a squeeze of lime juice. While service is quick at Eyuzu, its always nice to order some nibbles while waiting for the mains. 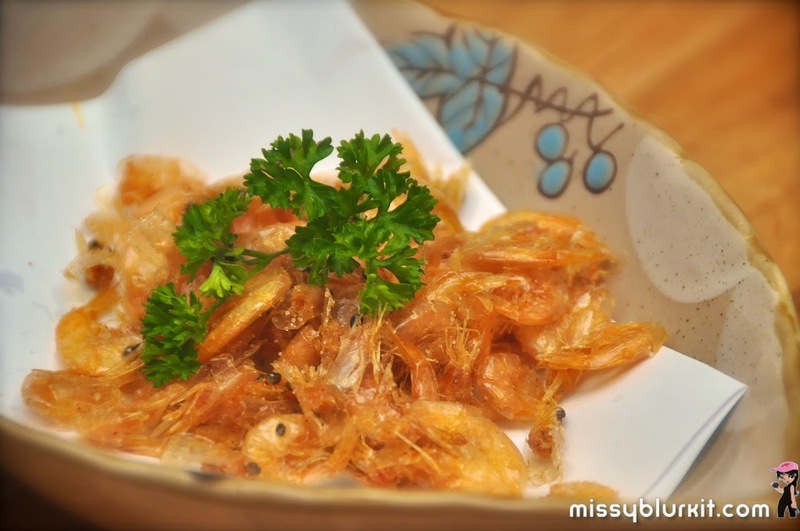 The husbter's all time favourite and terribly addictive deep fried river prawn is so good. Crispy on the outside but still relatively soft inside. 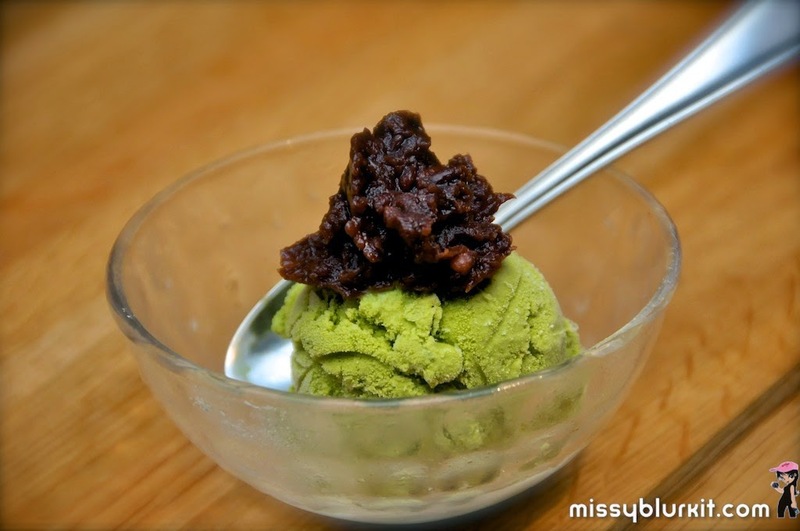 Perfect with sake too! Love oysters? Then this gratinated oyster is a must. Big plump and juicy oyster that goes perfectly well with the shell licking good gratin of cheese and cream. Can't go wrong when one is served with thinly battered seafood and vegetable. 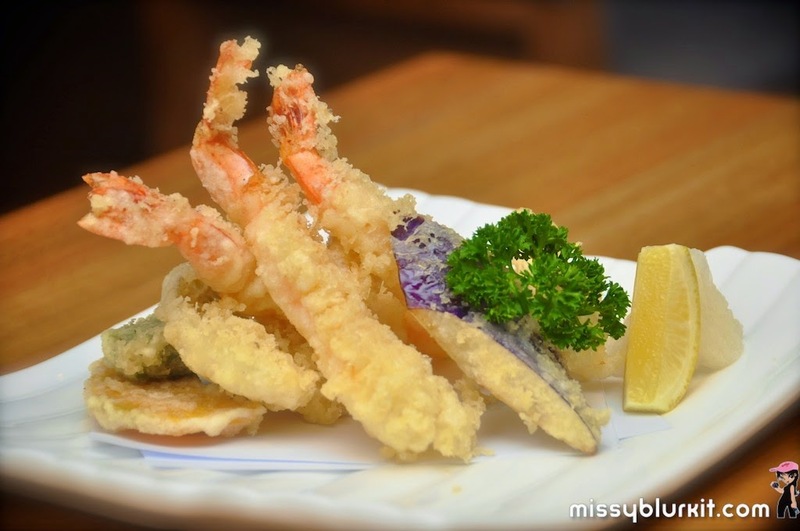 One of my fave must have at Japanese restaurant would always be mushroom teppanyaki. Cooked just right and still maintaining a subtle crunch and a glorious buttery sauce. 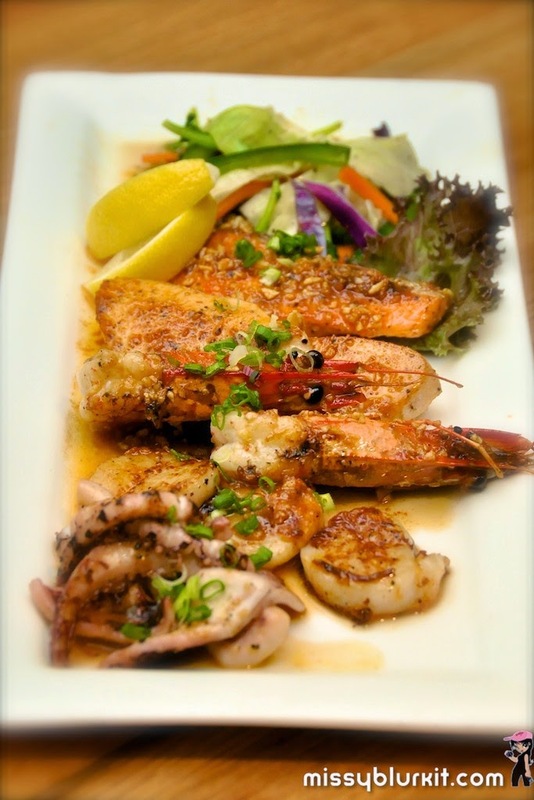 More teppanyaki goodness with squid, prawns, salmon and scallop. 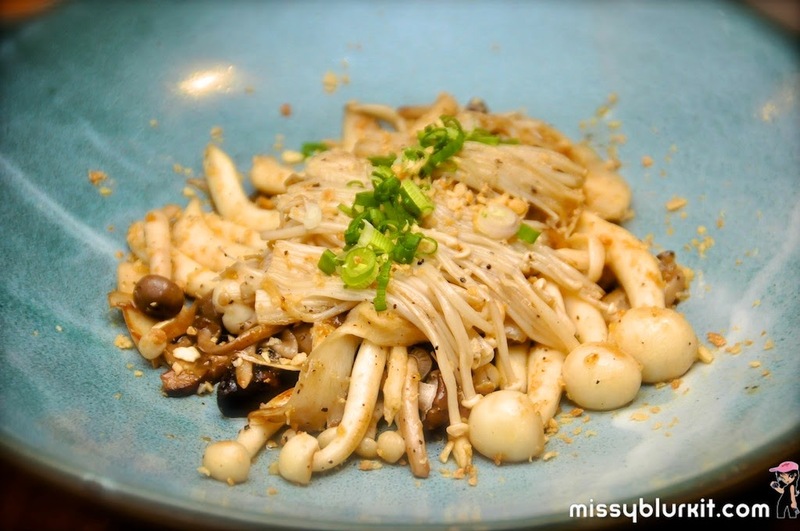 Must say this has to be one of the best squid teppanyaki we had...its tender and not rubbery. Juicy piece of scallop cooked just right...at this point I was tempted to have a large bowl of rice to go with this teppanyaki since its going to be such a waste not to finish up the rich seafood gravy. 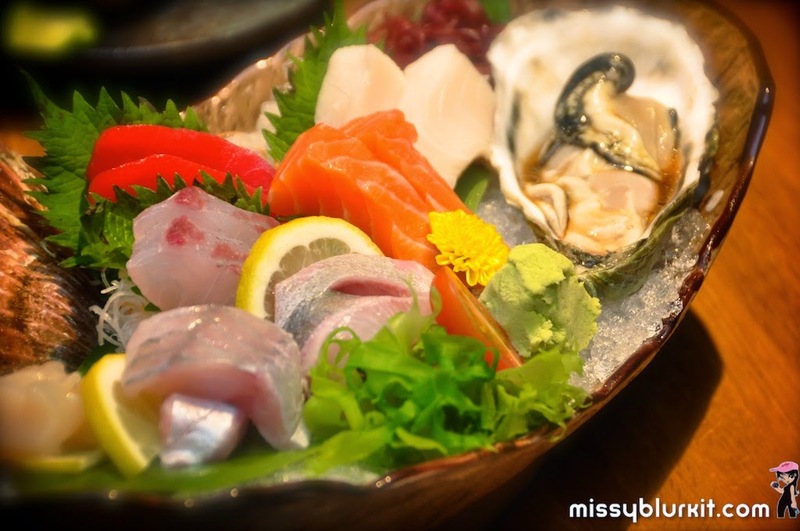 I will never say no to sashimi. 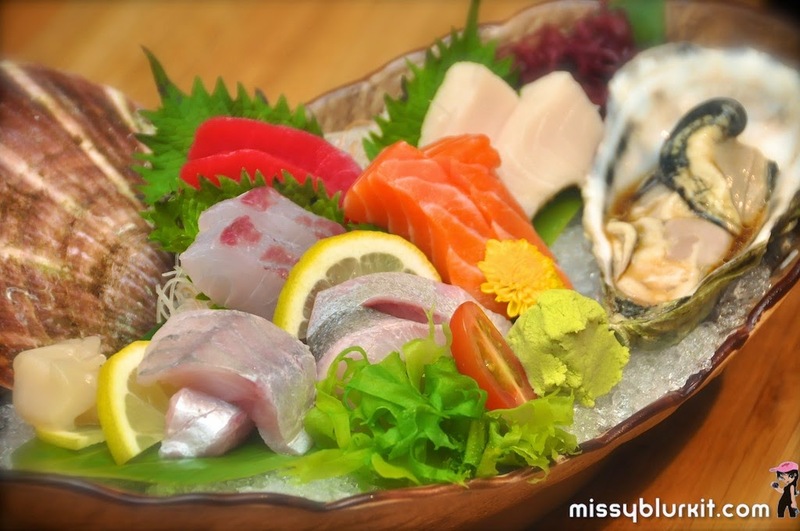 This platter of fresh and thick cuts of sashimi including my all time favourite tuna. 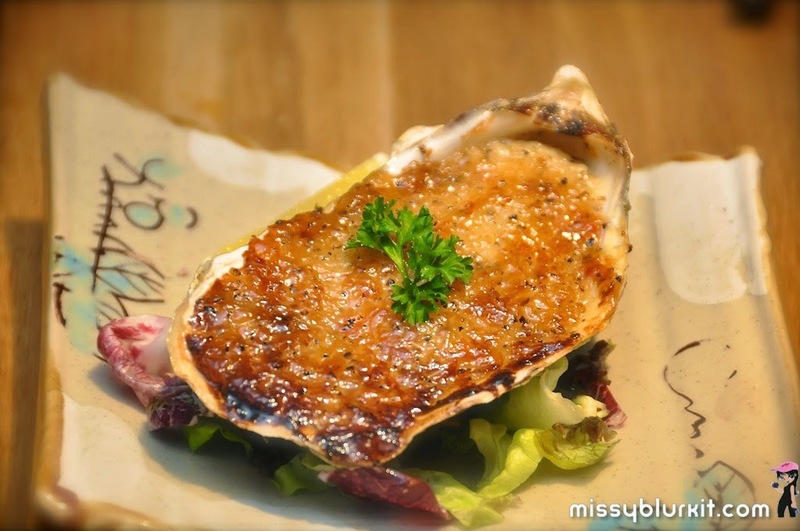 And if you love oysters, then you might want to order the fresh oysters served with a citrus soy sauce. 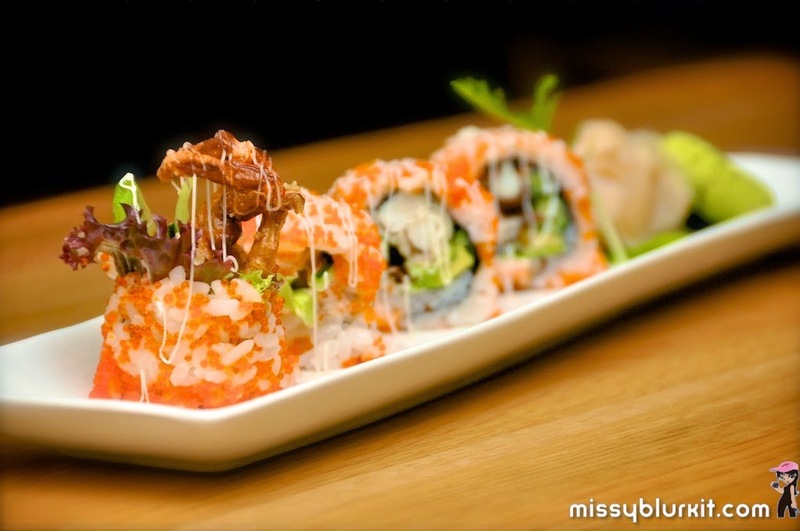 Love the play of textures on this maki of deep fried prawns, cucumber, avocado, flying fish roe and tempura cracklings. And its certainly not dry at all since there is quite a generous serving of flying fish roe in this maki...a lovely popping savoury goodness in each mouthful. 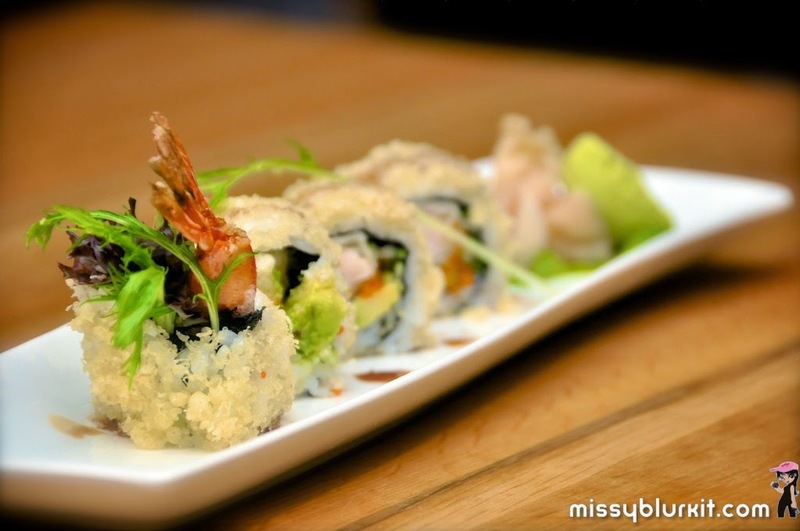 Another lovely maki with a lovely texture and flavout in every mouthful with tasty deep fried soft shell crab, crunchy cucumber, avocado, mayonnaise, rice and seaweed. The luxurious taste and texture is now from the flying fish roe that is mized with the rice! I missed the Matsutake and Shin Sanma specials that is going on now till October 2014. Reckon the only way is to make my way there soon to check out this seasonal goodness! Note that the 30% discount from Offpeak.my is only for ala carte dishes! So head on there for your lunch real soon if you want to enjoy the 30% discounts.